Calculations – Summit Anchor Co. Simply put: To install a safe, adequate and effective fall protection system we need the building material specifications. Why do we need calculations? Our engineering team makes calculations to determine if the anchor will support the load it will carry – up to 5,000 pounds without negatively impacting the anchor. 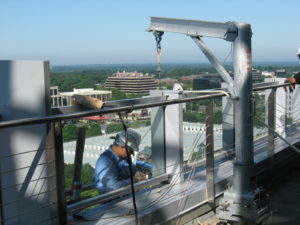 This is important to ensure that a fall protection system provides safe working conditions for maintenance contractors working at height but also a system that meets OSHA requirements. For your next building project or retrofit, make sure Summit Anchor designers have your project structure drawings to make these calculations. Fill out the design service form today and a Summit Anchor representative will contact you regarding your fall protection and suspended maintenance equipment design plans. Go to the edge with Summit Anchor.